Which statements about the following Swift code are true? 1. The output will be BAR. 2. It's not legal to reuse the name s on line 1. 3. 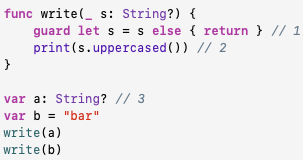 There should be a question mark after s on line 2, since s is an optional string: s?.uppercased(). 4. The value of a is undefined after line 3. 5. Not supplying an initial value is a compile error on line 3. The key competency is optionals. The code tests basic optional behaviour – initialization, the guard statement with a conditional binding, scoping rules.